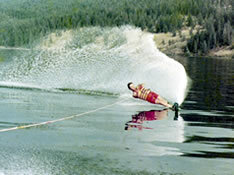 Waterskiing has been enjoyed on Okanagan Lake practically since the first water skis were developed and boats got fast enough to tow skiers. 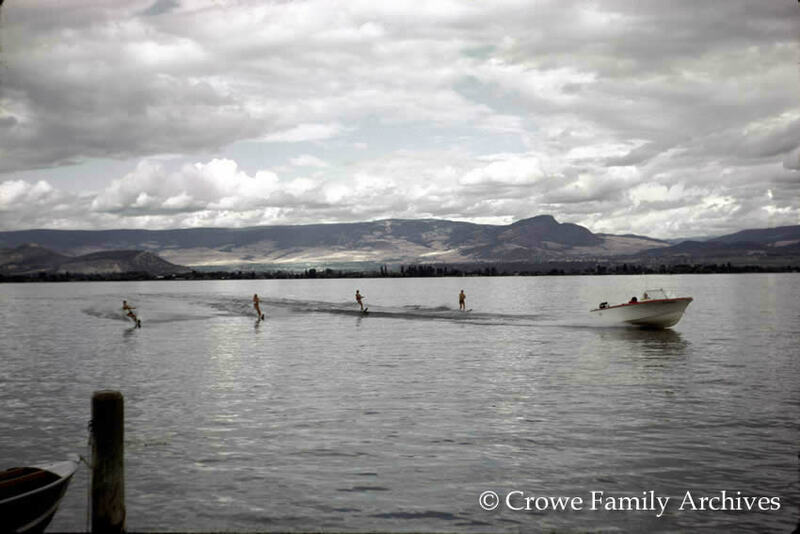 In the 1960s, a waterski club was located on the western shore of Okanagan Lake, just south of the Kelowna bridge where Shelter Bay Marina stands today. It boasted a floating clubhouse complete with judges’ stand, a slalom course, and a jump kept slippery with pumped water. The waterski club held slalom, trick and jumping events at this site. 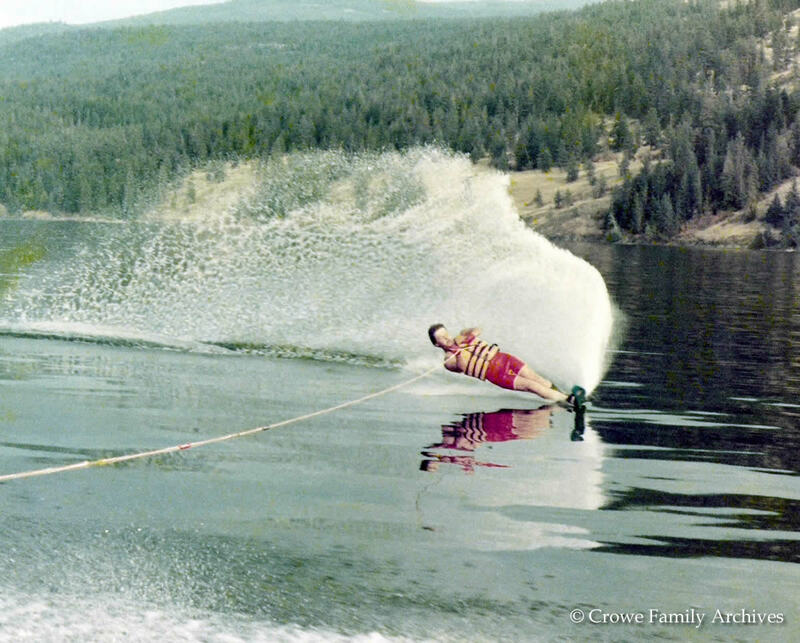 Kelowna's renowned Athans family started water skiing competitively here, with George Jr. going on to become two-time world champion, and national champion for ten years running. Over the years Kelowna has produced many talented skiers and coaches, with some second-generation skiers following in their parents' footsteps. Back in the late 60s and early 70s the shoreline's abundance of bulrushes and reeds absorbed boat wake, as is the case today on many private lakes. This vegetation, and the small number of power boats on the lake, made waterskiing possible throughout the day. 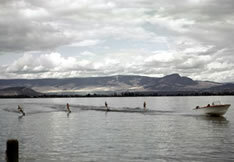 Today, Okanagan Lake is just too busy to pull off a water ski competition. 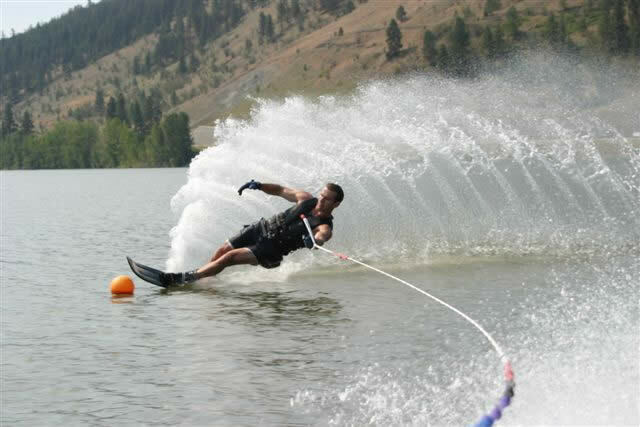 They still hold a few local competitions on smaller Wood Lake and Duck Lake and there are also a number of organized Ski Clubs in the Okanagan Valley. 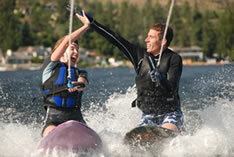 Today there are still a few private slalom courses scattered up and down Okanagan Lake. They can really only be used in the early calm mornings throughout the summer months because of the heavy boat traffic that comes out way too early as far as the slalom skiers are concerned. You will see the local slalom skiers cutting up some early morning glass along the south eastern shores between the bridge and Mission Creek. Waterski technology has changed considerably since the original wooden flat bottom slalom ski, to the new super light high performance carbon fibre skis that are used in competitions today. The newer wider slalom shape skis have improved the ease of use and increased the fun factor back to the recreational water skiers. The bindings have gone from the original thin plastic straps to the new comfortable adjustable boots or the fixed (non adjustable) high wraps and now into the hard shell bindings for the elite skiers. The floating bridge works as a great wind block if you have a slight breeze happening. If the wind is blowing out of the south, the north side of the bridge is where to go, and if the wind blows out of the north, the south side of the bridge is the best place to ski. Heading 15 to 20 minutes north or south of Kelowna will find you some better skiing conditions later on into the morning. During the spring and fall, the lake is not as busy with boat traffic, and with the proper gear these can be the best times of the year to ski. 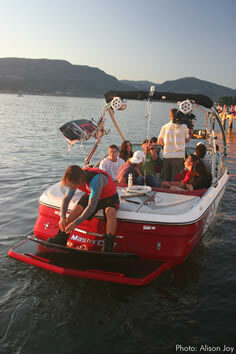 Spring is a great time to get out on the water but the lake can still be very cold from spring runoff. At this time of year, you need to be careful of floating wood debris from the creeks that could either hit your ski or propeller, and harm you or damage your boat. In the fall, the lake stays quite warm well into September, but morning air temperatures can be really cold. Skiing later in the morning and into the early afternoons are usually the best times of the day to go. With lower boating traffic it's easy to find calm waters at this time of year. 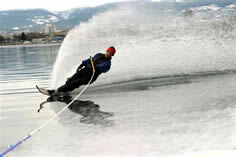 Check back soon for new waterskiing updates, photos and videos. 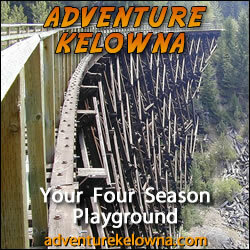 For more Kelowna watersport information and videos check out wakeboarding and wakesurfing.